And that can make it really easy to miss out on profits – or even lose your money entirely. 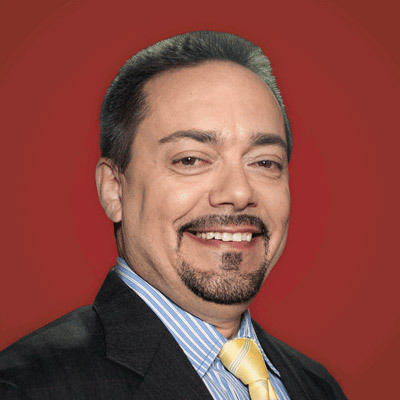 But you can exploit any company every earnings season – good or bad. As we’ve talked about before, earnings reports are dominating the financial TV networks, websites, and even newspapers. For example, you’ll often see a stock ramp higher in price before the company releases earnings, which could drive the markets higher. And if you don’t know the pattern, you’re virtually entering the trade blind. Now I’ve got a proprietary system that can help you position an option trade prior to the report and capitalize on this price move higher. 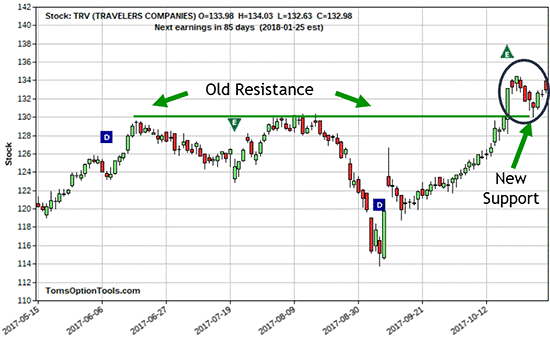 What you’re looking at below is the average percentage move in The Travelers Companies, Inc. (TRV) prior to earnings, which is in the 1.25% range. And we’re going to use this as an example to see what happens if a stock gaps higher, makes a new high, or takes out a previous overhead resistance area after its earnings report. Now there are times that options traders may try to get into a trade (let’s say a long call) in advance of the earnings or even the day before the announcement only to find that they can’t enter into the trade. Sometimes a technical breakout can fail, which is actually even better. In this case, the stock trades above resistance intra-day and then closes under that price. This is likely to become a failed breakout (we’ll talk more about that later).When a stock does break out and it closes above resistance, that gives you more conviction that the price move will be sustained and that higher prices can be expected. This move shows the stock testing that old resistance and a bounce that makes the old resistance become a new support level. The stock ran-up before earnings came out, as it has shown a consistent history of doing. That took it past its existing resistance level at $130. It then held above that resistance point for a handful of trading days, even after earnings. It didn’t go into a full-scale tailspin and drop a huge amount. As you can see, it performed the classic “old resistance becoming new support” technical pattern and tested the $130 support for one day before shooting back up in price. This pattern can also work in reverse, where old support becomes new resistance. So keep your eye out for stocks that break out above their previous resistance points or pivot point highs where a stock may break out coming off earnings. You’ll want to keep this on your radar so you can track the stock’s previous high – maybe set an alert, if your brokerage platform allows for that capability. And when it comes back to that price, be poised to initiate a bullish option trade (or bearish in the reverse pattern). The main problem I’m have is I need to find a place that will let me do options. Because Fidelity Investment won’t even let me at the lowest level that is why I’m missing some really nice options that are set to give me some nice payouts.. So now you know my problem I need to find an option investment firm. Yes I need help on that still trying to get more of trades and the right time to sell ..